Is your sporting association looking for a completely new look? With the ladies club promotional jacket, your players and supporters will remain warm during winter while spreading the word of your association. Made from a lightweight polyester material, these jackets feature a contract panel on the shoulders, half elastic sleeves and hem, full front zip and zippered pockets. They are breathable, quick drying, iron free, and have UV protection. Available in some great colour combinations including white/navy, black/white, blue/navy and white/red, you’re sure to find a suitable option for your players and members. These jackets are available in sizes 8 – 18, are comfortable to wear and perfect for early morning or late night games in the cooler months, as well as all through winter. 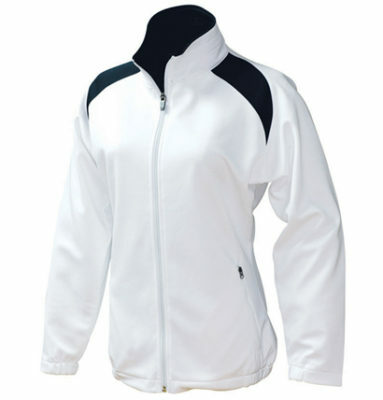 Team the Ladies Club Jacket with the Ladies Club Polo for a great overall look, perfect for any sporting association. Made from 260g 100% polyester lightweight Cool Dryfabric with brush back finish on the inside face, the Club Jacket is based on the Club Polo styling to create a complete range. With a contrast panel on the shoulder, and half-elastic sleeves and hem. It has a full front zip and a zippered pockets on both sides.